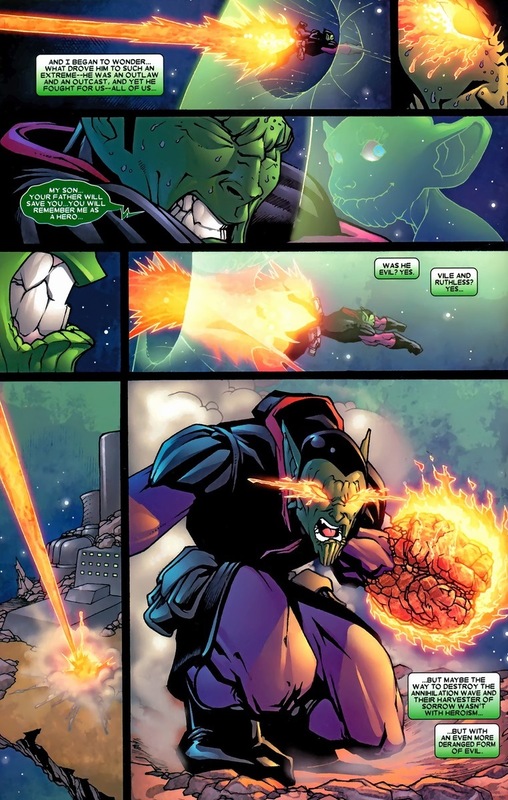 The only hope to save the Skrull planet of Zargaz’na lies in the hands of Skrull traitor/washed up war hero Kl’rt (y’know, the Super-Skrull). The guy’s tough, but he’ll need an army to protect the planet and defeat the Harvester of Sorrow, a gigantic battleship that can destroy planets and other terrible things. 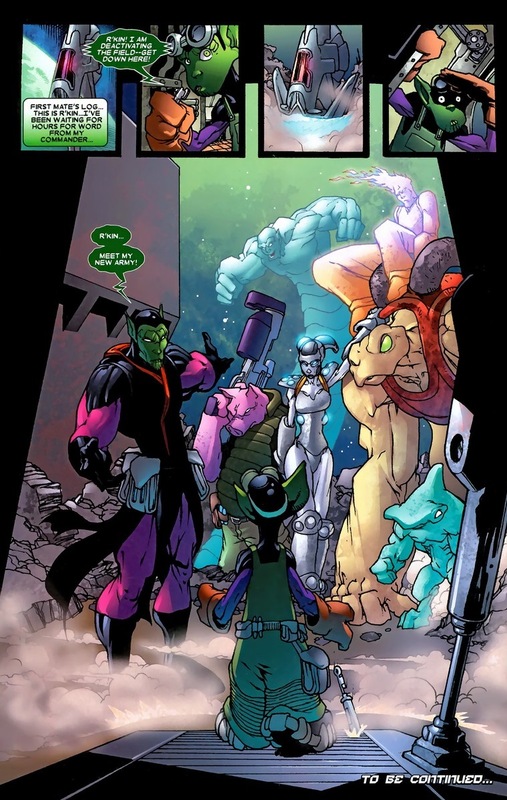 So far, his army consists of himself and a small Skrull child. Not a great start. Today, our protagonist mounts his initial attack on this bug-carrying behemoth. After a recruiting drive. 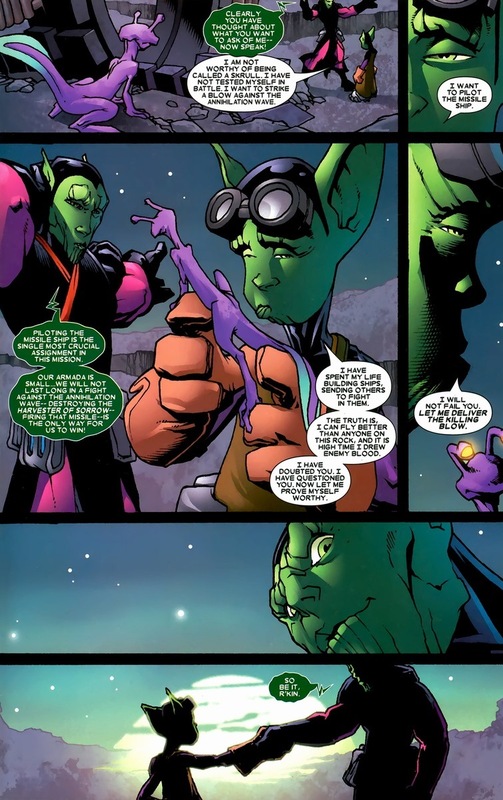 And remember the little Skrull mechanic who wanted to follow his father’s commander and his personal hero? 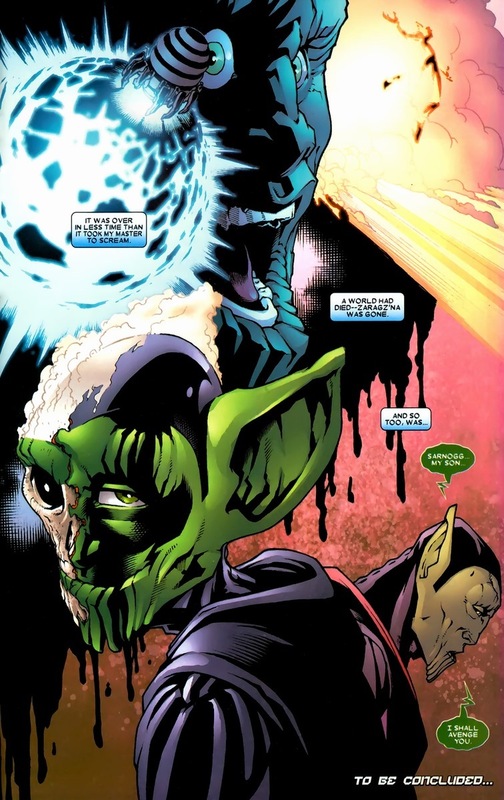 It turns out that the “super” part of Super-Skrull’s name is short for supervillain. 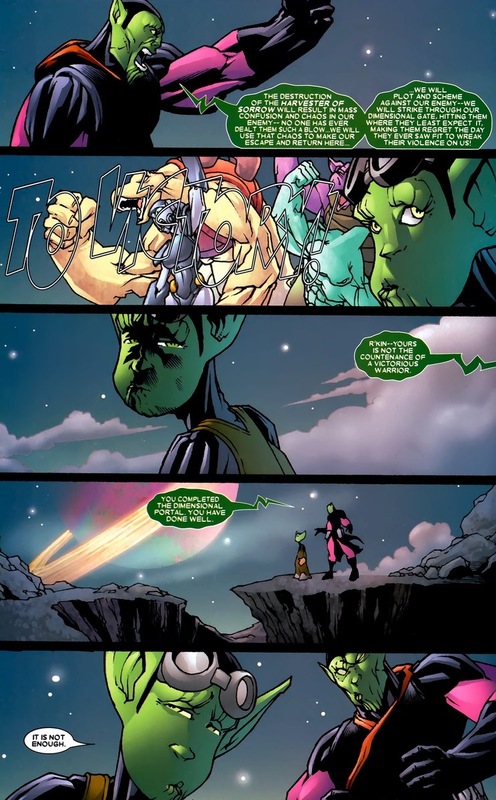 R’kin (the kid’s name) might be looking at Super-Skrull in black-and-white terms. 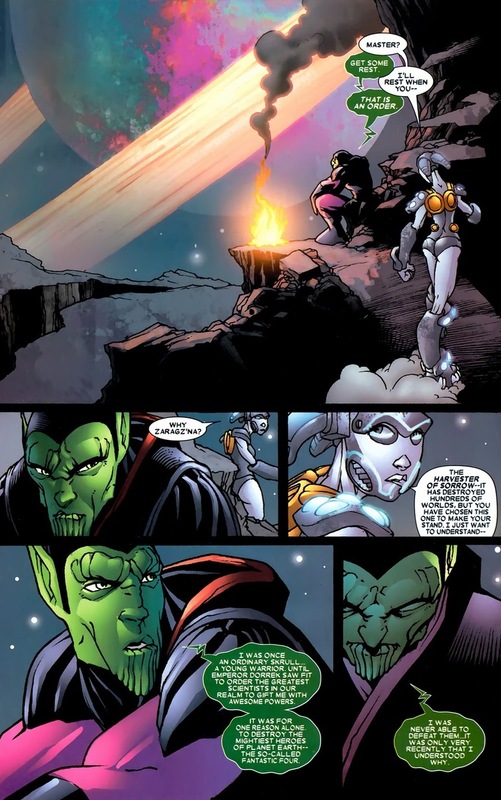 I mean, the Super-Skrull reeks of evil and his ruthlessness is only matched by his apathy in those who care about his ruthlessness. But the child constantly ignores the part Kl’rt keeps bringing up: he’s doing this for his son. 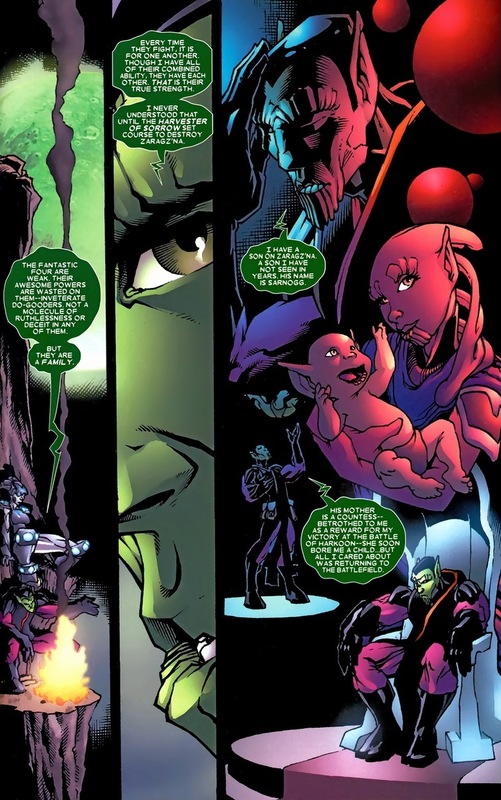 Millions of innocent Skrulls (and his son) live on this planet that will be wiped out within weeks by the Annihilation Wave and only the Super-Skrull seems to care about preventing this disaster. 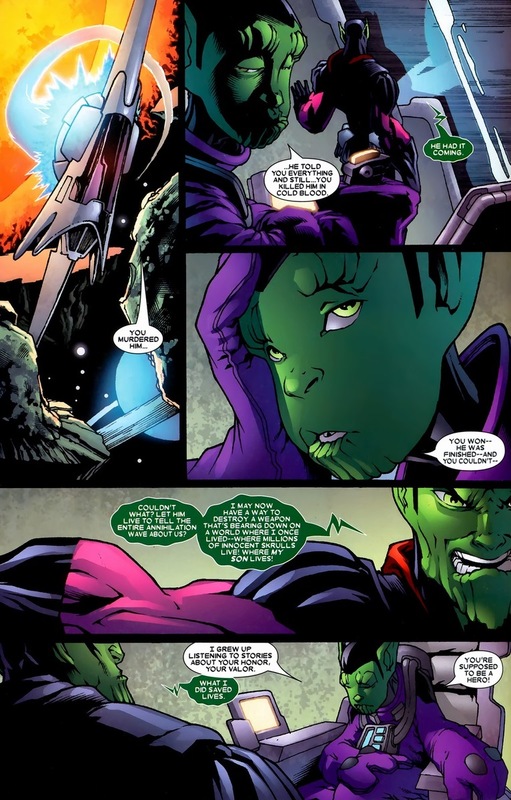 So yes, the Super-Skrull’s methods tend to border on supervillainy, but his reasons for this supervillainy are not evil. It’s complicated, but remember that R’kin, who narrates our story, oozes with bias. 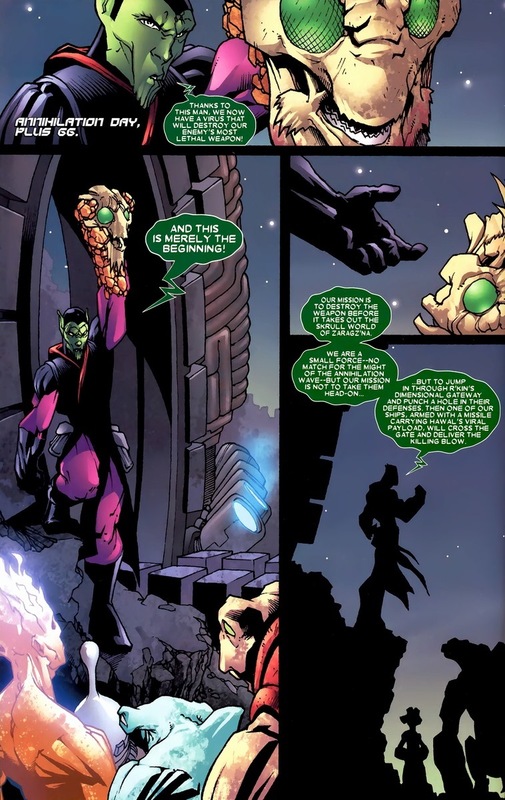 Also, before we all agree that the Super-Skrull seeks to destroy the Harvester of Sorrow out of the goodness of his heart, he does intend to leave behind a legacy as an immeasurable hero of Skrull culture whose tale will live on for thousands of years in history books. Supervillains’ selflessness can only go so far. Oh, and he gets his army. 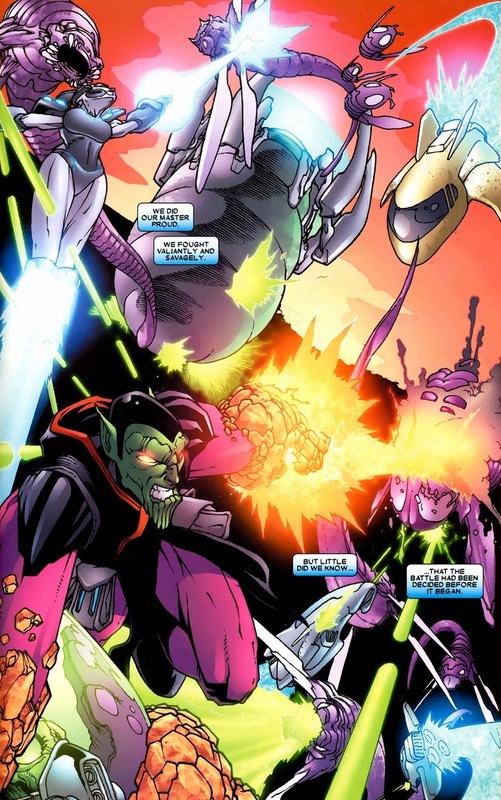 This miniseries accomplishes something incredible: within four issues, they bring so much character development to the Super-Skrull that everything we know and feel about the supervillain permanently changes. And still persists to this day. Look, he has simple origins. 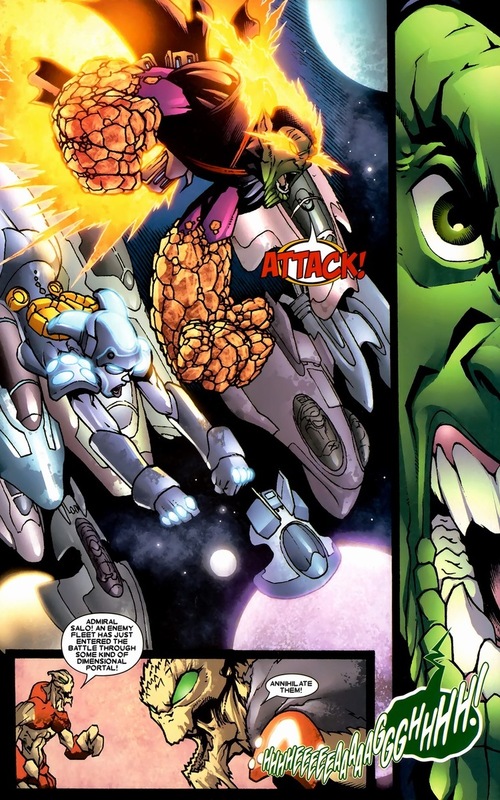 The Fantastic Four need more bad guys? Okay, what about they fight a one-man Fantastic Four? Boom, solid story idea. But we all forget that those characters who don’t look like humans (usually aliens) lead just as rich and complex lives as our Earth characters. Maybe even more so with the whole galaxy at their beckoning. 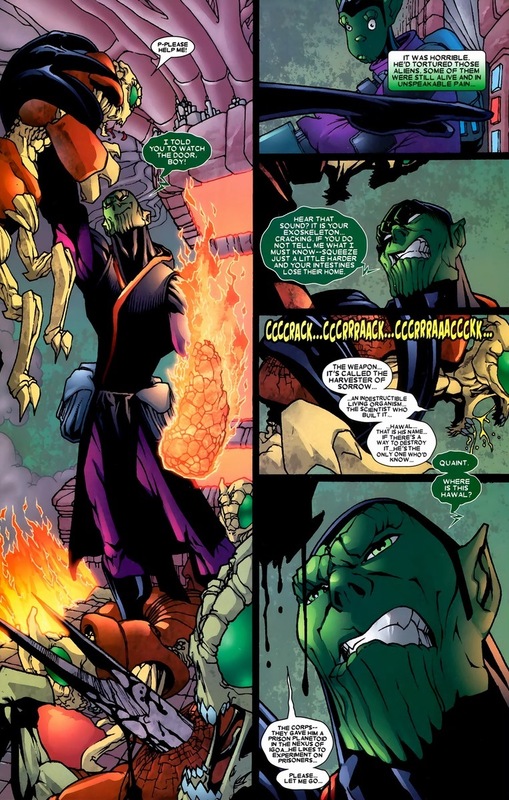 So yes, the Super-Skrull is evil. But like any good drill instructor — prove your worth, stand proud, and trust in his motivations — you’ll have a powerful ally fighting by your side. I remember an article someone wrote about Garth Ennis’ Punisher run. As a superhero, the Punisher is cool, but not exactly interesting in the long term. He has no insecurities, is driven by one solitary goal, and has a fairly boring personality. I love the Punisher, but Ennis accomplished a sixty issue run on the title by compensating for his protagonists’ faults through the Punisher’s villains. Each bad guy is dynamic, with amazing personality quirks, powerful back stories, and creative dialogue/actions that molds some of the scariest villains in Marvel history. We as readers eat that stuff up. 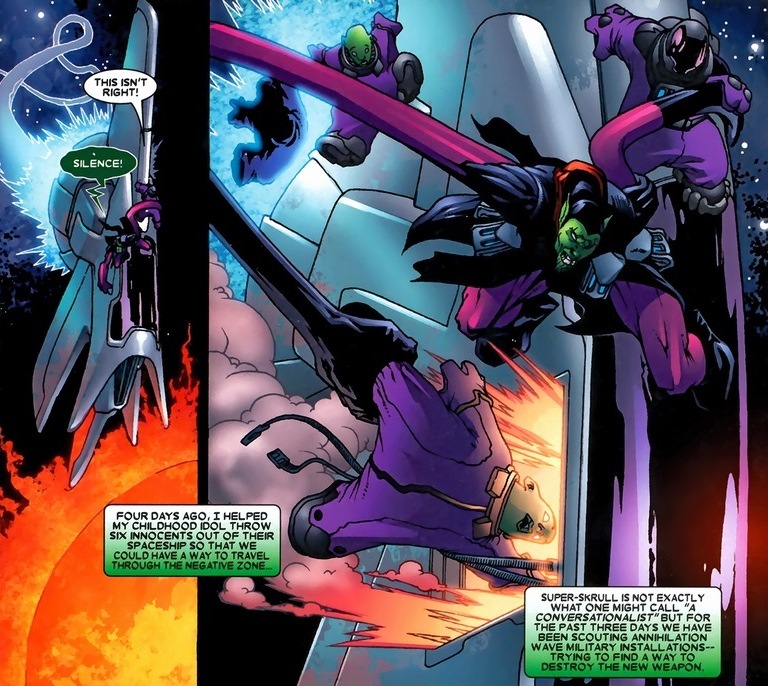 The big four: Magneto, Green Goblin, Doctor Doom, and Loki all epitomize complicated and fascinating baddies — it’s a testament to their popularity and longevity (though currently only one of them is still a full-time supervillain). Remember how Amazing Spider-Man #617 and #625 turned Rhino from fifty years of being a dumb brute into the three-dimensional, heartbreaking character we feel so strongly about now? 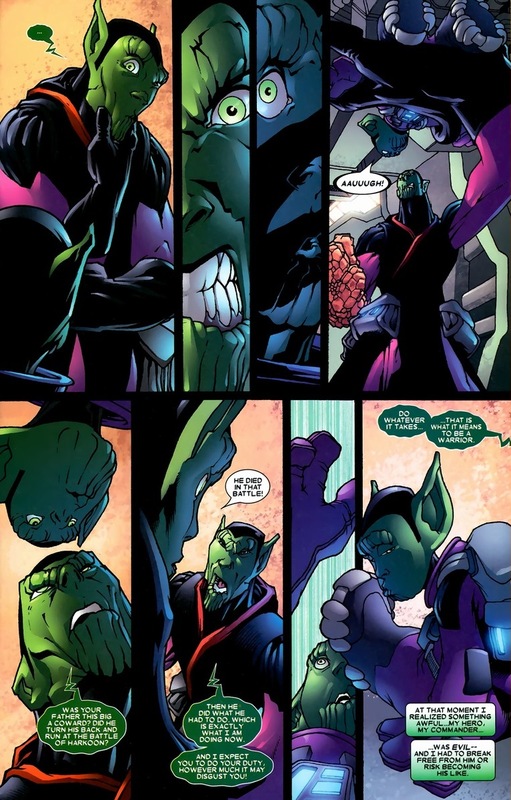 It’s storytelling at its finest, and now we can witness Super-Skrull’s well-deserved moment. On Monday, vengeance will be brought. 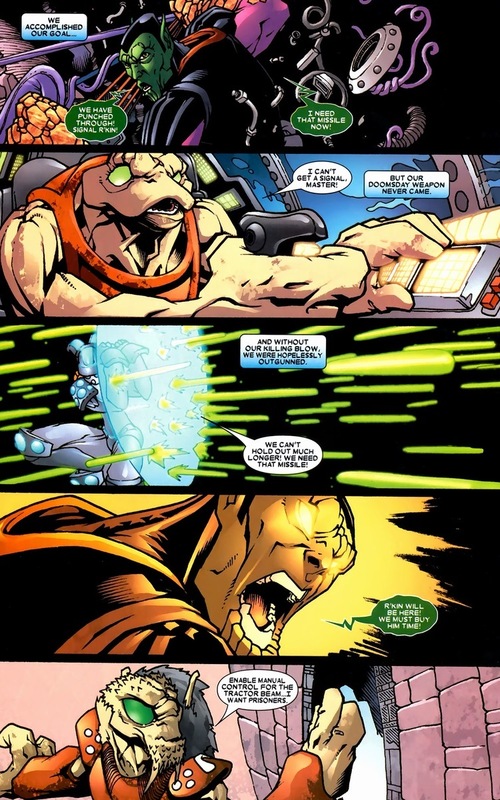 As scary as superheroes can be when they have nothing to lose, nothing compares to that same rage from a supervillain. Spoiler alert: it’s going to be bloody. Didn’t see that coming at the end….